That's what I see all around me when I look at how people interact with each other. Of course, the simpler name for proglodytes and conservatrolls would be "statists", but that just leaves them staring at you with no comprehension in their dull eyes. Most don't understand that word any better than they'd understand the more fun descriptive terms. Depending on where you live, the local government kinderprisons are either brainwashing kids to be proglodytes or perhaps, in rare cases, they are brainwashing them to be conservatrolls. Either way they are being turned into statists who will usually deny that they are statists ("I'm NOT like Mussolini!" as one complained to me once). The option of helping kids figure out how to think for themselves, and be responsible people who respect the rights of others isn't on the agenda. It's not useful to the State. That's up to you whether you accept your responsibility or not. But it's not only the State turning up the statism. Much that is created for broadcast and mass viewing is created by proglodytes, advancing the false narrative that their way is kind, compassionate, generous, and caring... while the others guys are just so mean and greedy. And if you work at it a little bit you can find the message created and advanced by conservatrolls, which says their opposition is so gullible and dumb that they'd blame you for not caring how your murderer feels after sawing off your head... and then your survivors should be punished for your crime of making the murderer feel he had no choice but to murder you. And you can listen to conservatrolls claiming to love the Constitution while demanding unconstitutional "immigration control". And supporting police-- which may be their worst failing. None of them, on either "side", want you allowed to run your own life, to keep your own property to use as you see fit, or to live in liberty. They want you controlled and enslaved so they'll feel safer. So each side squeezes your liberty just a little bit more, twisting and breaking you "for your own good", or for the sake of a "culture" which isn't worth saving and which has no room for people like you who understand and value liberty. I see both proglodytes and conservatrolls as monsters. I don't care which parts of the State they resist because they still embrace some of it. 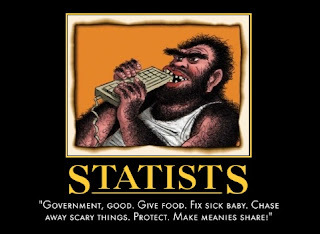 Embracing any statism is harmful to humanity. It's not compatible with human flourishing. Statism is backward, brutal and barbaric no matter what you call it or how you dress it up.